At the 25th annual ASCAP Rhythm & Soul Music Awards, producer Pharrell Williams was honored for his amazing hit making skills. He won the Golden Note award for his career as a songwriter and producer. 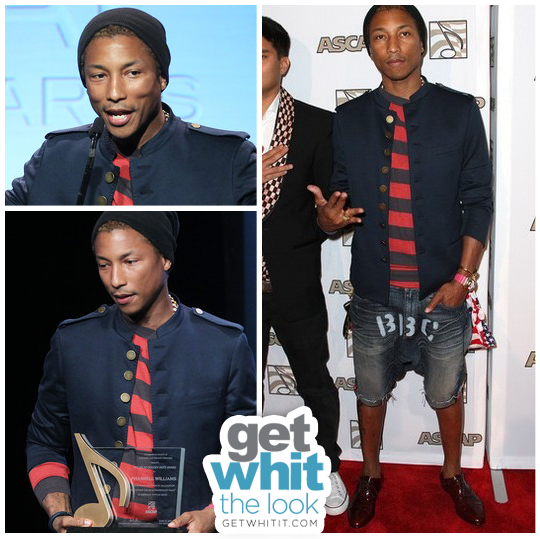 Pharrell wore BBC denim shorts, a striped red and blue shirt, brown dress shoes, and a Lanvin Military coat. His Lanvin Jersey Military Jacket has a hefty price tag of $2,250. This is rather unique look but Pharrell can pull off almost anything. Fellas, wanna get a similar style? Check out what we've found below!